My Pet Shop is a new simulation game for animal crazy kids on the Nintendo DS. Will the cute critters and crazy characters keep you coming back for more? We were excited to hear about My Pet Shop, a new animal game published by Square Enix and developed by the team behind the excellent Cooking Mama titles. 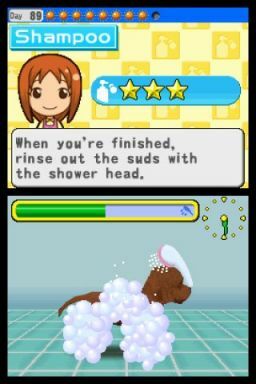 This new DS title certainly looks the part, but can it do for animal games what Cooking Mama did for cooking games? Dogs and cats in My Pet Shop will happily stand while you soap them, then spray them with water. Having just moved from Emerald City to the quiet backwater of Green Town with your mother, you arrive in the quiet village full of strange looking people. You'll learn fairly quickly that the inhabitants of the quiet town don't have any pets to call their own and there's quite conveniently a huge gap in the market for a super duper pet shop, one that you and your mum are eager to fill. After meeting everyone in the village, your mother suggests that you go out and catch a pet of your own. To do this, you head to the nearby woods. Once there you can shake trees and bushes to make animals appear. Snakes and bombs will sometimes appear too, which need prodding or rubbing to make them go away. Luckily the woods around Green Town are teeming with domesticated animals like cats and dogs and when you encounter one, you can try to catch it. Catching animals involves a simple mini-game. Each turn, the player can creep forward, step backwards, stand still or throw out some food. The idea is to make the animal feel at ease so that it will come right up to you. Once it does, it's yours to keep. Once you have a pet of your own, you can summon it during this sequence too, although doing so doesn't really seem to have much benefit. Usually the best way to win an animal over is by throwing down some food, meat for dogs, fish for cats and carrots for rabbits. Once you catch your first animal, you'll take it back to the shop and start to learn to care for it. The first animal you catch can be kept as your pet and as the game progresses you'll learn the various ways of caring for it. Your reputation as an expert animal catcher will spread too and soon, you'll have customers clamouring for you to find them a pet. As you advance through My Pet Shop, other locations unlock with different animals to suit the different characters you'll meet in the game. Each game day is divided up into several time units. You use these up either hunting for animals or taking care of them. As you play, your mother will teach you different ways to care for the animals. You'll be able to take them for walks, brush and wash them, give them treats, teach them tricks and even enter them in competitions. Curiously, even simple tasks like throwing some food take up as much time as bathing an animal, or going to the woods to hunt for more creatures.